This is a place beyond common mortal understanding, it hangs in the balance between Heaven & Earth, staying invisible to the human eye while existing both among us and beyond us. All white lighted creatures exist in that plane, sometimes traversing the mortal realm at will to grant wishes, blessings & miracles in the lives of the deserving. 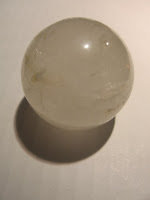 This crystal sphere, shaped for contacting the beautiful fairies it is meant to channel, will align your energies & open up the invisible door within to the powerful portal that connects mortals to the spiritual Fairy realm. When the sphere arrives you will feel a rush of warmth and I noticed a bright white light that stayed with me for several minutes after I first touched the sphere. The magic will begin to work within you immediately, opening the portal to its full extent within 24 hours! Then the miracles come! The Fae/Devata/Spirit portal will begin the flow of white lighted magickal creatures into your life- especially those of the Fairy family. The sphere will exude a frequency out into the Universe calling these magickal entities to you and allowing them to know that within the sphere is a safe haven for their kind. Soon your sphere will fill with the magical creatures and their amazing powers will start to appear in your life! Talk to the fairies, you will sense when they are stirring, explain you problems or deepest desires- fairies are very good listeners. They will take these issues to heart, desiring to protect-guard & please the mortal that has taken them in and will begin to work their celestial magic by fixing your problems, granting your wishes & bringing all the blessings of the spirit world into your life! 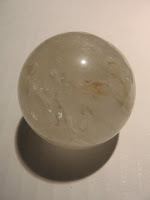 This sphere is already magically active with the starter Fairy that the Spellcaster attached to the beautiful fairy sphere to open the portal as well as act as your guardian against any evil or negativity that would try to enter through it. She will protect you from bad spirits as well as teach you in the ways of the Fae & beckon many of her spirit friends to join her. 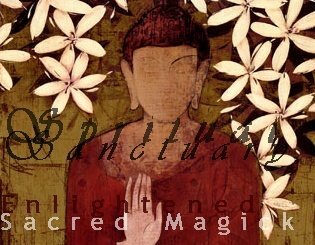 She is an ancient spirit who knows nothing but white lighted magic & will never harm you. She brings Joy, Peace, Calm, Fertility, Love & Happiness into the life of the mortal who takes her in. She will be a life long friend & spiritual guide who you will always cherish. She makes everything more magical & blesses all those near her with wonderful miracles! This crystal is made of quartz I have only a few of these and they are truly breathtaking- if you love fairies, white lighted entities & real magic to open up in your life this sphere will be one of the best things that has ever happened to you!